Trajan AE Dupondius. Rome Mint 112-114 AD. 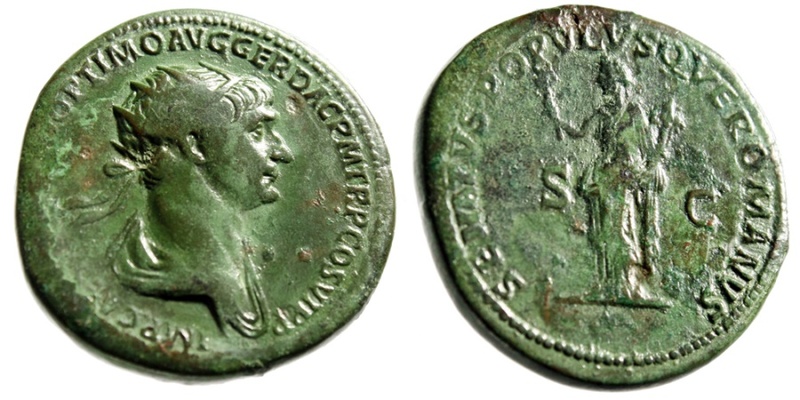 Obverse: IMP CAES NERVAE TRAIANO AVG GER DAC P M TR P COS VI P P Radiate and draped bust of Trajan right. Reverse: SENATVS POPVLVSQVE ROMANVS Felicitas standing left, holding caduceus and cornucopiae; S-C to sides. References: RIC 635. Size: 28mm, 13.88g. Numismatic Notes: Good-fine grade with a stunning gem-like green patina!